Reader Adele recently commented that she has a big birthday coming up, and is pondering whether to sell or recycle some of her unworn jewellery in order to commission a piece to mark that happy occasion. Her thought process is the "Love It or List It" of the jewellery world, and just like that TV show, I cannot resist watching. I thought, Oh no no no; Love It! The brooches have so much character and romance. The necklace is pretty and wearable—but the use of old-cut diamonds in a modern piece creates a dissonance, like sticking a bay window on a 17th century castle. I hope the jeweller doing the reno showed her modern-cut diamonds versus these old cuts, so she can see the difference. If that was done, and she is happy, there you go. I'd buy a great jacket instead, and wear both brooches together. I might have the diamond brooch adapted to be worn as a pendant. Harvey and I agree on restyling all or some of the items from a parure, in North America often called a "set", for example, a matching ring, necklace and earrings. But again, if the setting and stones are beautiful, you could gift or sell all but your favourite item. Just like the TV show, "Love It" means a decision about what goes, what stays, and the total budget for the project. Given the current cost of gold, a reno may cost more than the original item, but look what you end up with! 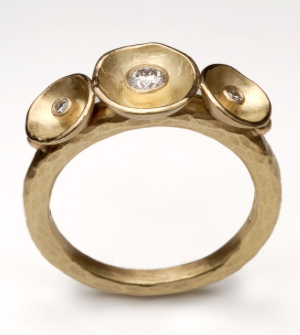 The example shown is a commissioned piece by London jeweller, Malcolm Morris. That's a sumptuously heavy band, no stinting on the gold, and good for Malcolm and his client! Many women wanting to convert old jewellery to cash decide, wisely, to get an appraisal. Find a certified appraiser and tell her you are planning to sell; most appraisals are done for insurance purposes. The American Gem Society provides a good checklist here. Why not benefit from the appraiser's knowledge of the market, as well as of the value of the piece? (Many appraisers have extensive experience buying and selling.) At auctions, jewellers buy some pieces to tear apart. If you consign to an auction house or consignment jeweller, realize that dated designs will not bring as much as a piece that could be worn as is. The one thing the owners on the TV show don't do is give away homes! But I've done that with craft jewellery such as silver rings set with semi-precious stones. When we did the Mighty Downsize, I donated a shopping bag of that sort of thing to a Toronto church's auction. (The church used a certified appraiser to set starting bid prices.) Sometimes you can get a charitable donation receipt. 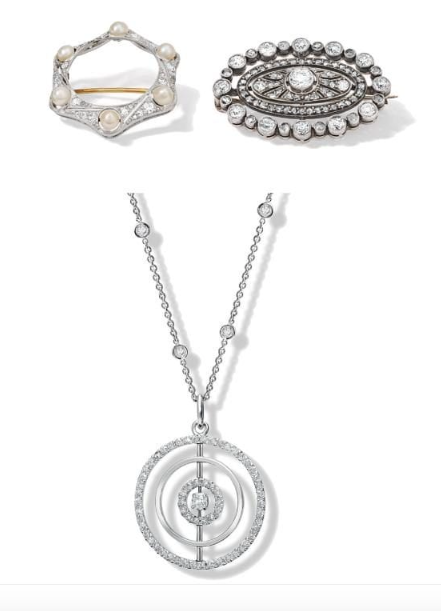 Rachel and her sister inherited a pile of jewellery from their mother, Marsha; below are similar pieces. Can you guess what she did with each? Left: Garnet earrings bezel-set in 14k gold. Rachel wore them for a while, then gave them to her sister. For fine jewellery, Harvey offers a variant of "List It": "Park It". She says, "An idea to consider if you do not want to...reset a single piece is to put (it) in the bank and put the money saved in insuring it to one side until you have saved enough to go out and buy yourself a piece of jewellery you will wear." "Park It" works if you save those big jewellery riders (Dowager Dollars?) but if, like Adele, you have a special occasion coming up, look now for jewellers whose work makes you whistle in admiration. Then you'll know where to take it. I would have kept that pearl brooch forever, but I'm sort of mad about pearls... but you're right in that it's a very personal choice, and if the owner is ultimately delighted with their new piece, more power to them! Love hearing your take on the 'reno' featured in the news article. And the personal stories about how people deal with inherited jewellery are always fascinating. Although our family doesn't run to the level of the pieces you show here, I too have given inherited pieces to my sister and nieces. And I have donated/given away non-family pieces as well. It's nice to think of them out there in the world being enjoyed. Reading this brought to mind a question about gold. I somehow assume that the higher the carats, the 'better' it is but realize that may be untrue. I know I could look this up but would rather get your perspective...maybe a post? I do love the little garnet earrings, but I love that colour. My grandmother believed in putting her savings (small as they were) into jewelry, and we have been lucky enough to have two fine old mine cut diamond rings to give to sons for their fiancees. One couple decided to keep the 1915 setting, and the second decided on a modern setting. I'm not sure the really modern setting works, but they're happy. Still trying to decide what to do with a few other pieces -- how would you suggest using smaller older diamonds and a large black opal? Lagatta: Burgundy is a very useful colourù and a nice change, since you do not wear pastels. Lynne L.: What to make with those gems depends on your taste (do you, for example, like black opal?) and what you or the recipient would enjoy wearing. You could have a ring designed with the opal and diamonds, for example, or use them separately. Impossible for me to say much with limited information. Also, your lifestyle is a consideration. Some persons inherit or are given gems that are just too much for them. Others have no qualms about wearing a seriously big stone. How wonderful to consider those factors! Lagatta's comments about her jeans rung a bell. I just bought coral chinos!! Now trying to decide if they are over the top / too young or fresh and uplifting for spring. I'm feeling a little what-the-hell so who knows. When my niece and her husband got engaged, he had a ring made using a diamond from one of his mother's rings, a diamond from a ring my mother had inherited and then given to my sister-in-law, and a new diamond from the jewelry store. The result was a pretty ring that's full of sentimental meaning. I inherited my grandmother's engagement ring, five old cut diamonds set in a row with some filigree-type work as part of the setting. The date 15-12-15 and my grandparent' initials are engraved inside, and I've opted to keep and wear the ring as it is rather than destroy the setting. As my birthstone is diamond, it's worked out for me. Just yesterday my hair cutter told me that she has gathered up bits and pieces such as orphaned earrings and broken chains and sold the lot to one of these cash for gold places. I've always been leery of that type of business, but she claimed she was treated fairly. I've been having trouble making corrections on my iPad. What a treat that I could provide inspiration for one of your posts! I think in many ways it's much harder to come to terms with curating a jewelry collection based on changing style, changing preferences, etc. than in curating a clothing wardrobe, because it feels like jewelry has more intrinsic value. The pieces I'm considered selling are not particularly valuable, nor are they heirlooms, they're things I just don't wear. For example, I have a couple of pairs of Ed Levin silver and gold earrings that I haven't worn in years. A lovely pair of antique silver and garnet art deco earrings with garnets that my husband surprised me with 25 years ago....and that I've worn perhaps three times. You get the idea. Plus, a couple of items chosen by my husband -- again, not terribly expensive -- that were never my style but I didn't want to hurt his feelings. Much harder to let go of those, but they're just languishing, unworn, in a drawer and none of my daughters is interested. LauraH: A couple of years ago I bought several pairs of Lands' End fine cords in lilac, red and mint green because they were discounted (as I recall $20/pr) and my old ones did not fit. Probably wear them one-tenth as often as blue, black and white, but they are a change. I keep the tops neutral and may venture a stripe but no busy patterns. Adele: I am grateful for your inspiration. If you want to sell, check prices on eBay; Ed Levin pieces show up there fairly often. For antique pieces, I do not know where you live but you may have a local jeweller or antiques dealer who specializes in vintage/estate pieces and will take them on consignment, or offer to buy outright. I have sold some unwanted jewellery on eBay, but signed pieces move better than "stuff". I agree, jewellery can carry a higher price tag than clothing. But just like clothing, you should buy something you can see yourself wearing everyday, and buy one good piece instead of four "pretty goods". The major error here is terror of something going out of style, so therefore the person buys something so staid and safe that it is already old! Selling scrap gold is a cool way to suddenly have a wad of cash in your hand. Check the spot rates first, then visit a couple of pieces. Or if you are having a jeweller make something, she will do this and give you the credit amount. I remember that cords post. Agree, I can't see wearing coral everyday but it would be fun in that its-getting-close-to-spring period. Agree again, no patterns but maybe cobalt or green on top with a bright fun necklace. Truthfully, I think this is part of my attempts to bring spring closer, along with plant orders and garden talks:-) Witch hazel is in bloom now and some snowdrops are out so I'm a happy camper. Cheers. Adele: Sorry, that should be "visit a couple of places". LauraH: Crazy weather here, too, but it's not even March yet so there can be more serious snowstorms. As for coral, I don't really wear coral-coloured tops, but have a couple I love that are stripey - mostly a sort of rusty red with narrower coral stripes - very 1970s. And I have a rough coral necklace; you know those little bits of coral, twisted, which I never wear, though I love the little critters. I'll really have to work on a project of combining them with other semi-precious stones and silver beads. Remember that in terms of pastel bottoms, it isn't just a matter of our individual taste, but of climate and social conventions where one lives.